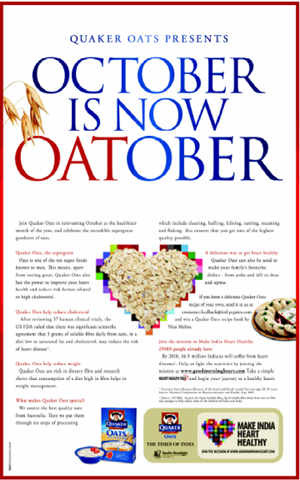 I saw a full page advertisement in The Times Of India dated October 01, by Quaker Oats declaring October as Oatober. 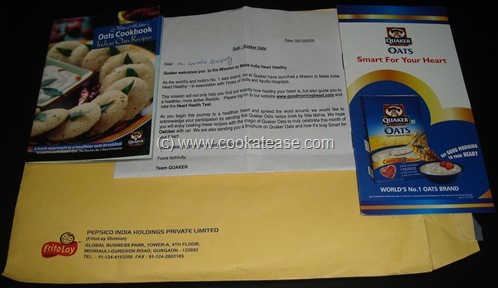 The advertisement further said that anyone sending a recipe (not copied) on oats would get a Quaker Oats Recipe book by Nita Mehta. I sent my recipe ‘Vegetable Oatmeal Broth/Stew’ on October 03 by e-mail and Quaker Team has sent the Quaker Oats Recipe book by Nita Mehta. I received the following on October 24 by courier. A brochure on Quaker Oats and how it is truly Smart for your Heart. If you have oats recipe of your own, still time is available to send it and get the book. Congrats buddy!! And thanks for sharing the info with us! Hi Nita, i tried this recipe and it came out very well…. take a chapathi put the filling a little away from centre and roll them into wraps.. Healthy oats wraps are ready to munch…. you can make a snack with oats for ur kid. 1.In a bowl, add 1/2 cup oats, flour, and next 6 ingredients (flour to salt), and mix well. 2.Add the pear, and make a well in center of mixture. 3.Add the buttermilk and next 5 ingredients (buttermilk to egg), and stir well with a whisk. 4.Add the flour mixture, stir until moist. 5.Spoon the batter into muffin cups coated with cooking spray,sprinkle 1/4 cup oats evenly over batter. 6.Bake in a pre-heated oven for 10-12 minutes until done. 7.Remove from pan and cool on a wire rack.